returns the number of hard particles (i.e. those supplied by the user). 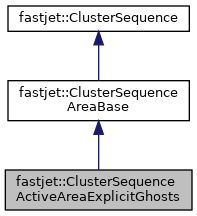 Like ClusterSequence with computation of the active jet area with the addition of explicit ghosts. Definition at line 57 of file ClusterSequenceActiveAreaExplicitGhosts.hh. returns a four vector corresponding to the sum (E-scheme) of the ghost four-vectors composing the jet area, normalised such that for a small contiguous area the p_t of the extended_area jet is equal to area of the jet. Definition at line 80 of file ClusterSequenceActiveAreaExplicitGhosts.cc. true if the entry in the history index corresponds to a ghost; if hist_ix does not correspond to an actual particle (i.e. hist_ix < 0), then the result is false. Definition at line 91 of file ClusterSequenceActiveAreaExplicitGhosts.cc. Definition at line 97 of file ClusterSequenceActiveAreaExplicitGhosts.cc.